Laxatone hairball remedy is a product intended to treat and eliminate hairballs in cats. The ingredients include white petroleum and mineral oil, and both of these are lubricants that will coat any hair your pet swallows and encourage elimination. Petromalt hairball remedy is another product that treats hairballs, but Laxatone uses two lubricants instead of just one. There have not been any side effects reported with this treatment, and the product comes in a tuna flavor that cats love and take readily. Administering Laxatone hairball remedy is easy, because you just squeeze the desired amount onto the nose or paw of your cat, so that they can lick the gel completely off. Laxatone is a cat hairball prevention treatment, as well as treating any hairballs that your cat already has. When you use this product regularly your cat will experience improved digestive health, and constipation will be a thing of the past. Laxatone hairball remedy is recommended by a number of vets for cats who tend to develop hairballs, as well as cats who have frequent or chronic constipation. This treatment can also help if your cat throws up after eating because hair is clogging up their digestive system, so that this symptom is eliminated and your cat can enjoy mealtime again. Laxatone hairball remedy is safe and effective to use, even with young animals, and there are no risks involved. There is no prescription required, and the usual dose is between one half and one teaspoon a day to start with. Once the symptoms are under control then the dose can be decreased, and only given two to three times per week. 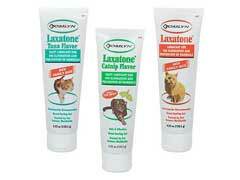 Laxatone is one of the most popular and effective cat hairball remedy treatments found on the market. Gentle lubrication will help your cat eliminate hairballs without vomiting or experiencing other symptoms, and can keep your cat free of symptoms when treatment is given on a regular basis.